Unit 6, Malvern View Business Park, Bishops Cleeve, Cheltenham, Gloucestershire, GL52 7DQ. 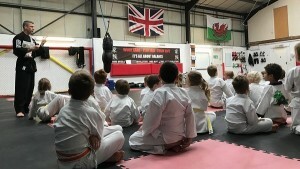 Welcome to Mini Dragons, the fun and safe fitness training syllabus for children, 3 to 5 years old. The syllabus is designed to encourage the development of motor skills, balance, endurance, flexibility, strength, and the coordination of eye, hand and foot. Through this development, each child should find greater self-confidence and self-esteem while getting ready for the next age group. » Building Confidence in kids! » Nominated for Academy of the year award!! !